When Santa and the elves are busy preparing for the holiday season, I like to treat them to all their favorites for all their hard work. An all-time favorite is anything and everything apple! I stumbled upon this Apple Crisp Stuffed Apple recipe by Creme de la Crumb, and it looks so apple-so-lutely divine! First, prepare the crumble topping. In a medium bowl whisk together flour, oats, brown sugar, sugar, salt, and cinnamon. Cut in the butter with a pastry knife, or two forks, or with your hands until mixture is crumbly. Set aside. Peel and chop 4 of the apples. Add chopped apples, butter, brown sugar, and cinnamon to a medium sauce pan and sauté over medium heat for 8-10 minutes or until apples are tender. Remove from heat. Chop the tops off of the remaining 4 apples and use a spoon to scoop out the flesh. Discard the flesh or save it for another recipe. (See Note) You don’t need to get every little bit out, just enough to make a “bowl” for the filling. Fill scooped-out apples with apple filling from the sauce pan. Top with a generous amount of crumble topping. 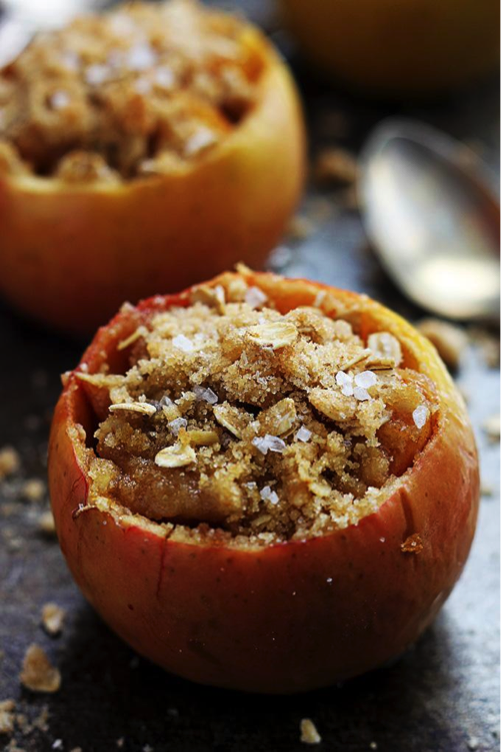 Place stuffed apples on a baking sheet and bake for 10-15 minutes until crumble topping is crispy. Serve warm and top with ice cream and caramel sauce if desired. Enjoy! With only 8 ingredients — apples, butter, sugar, brown sugar, oats, cinnamon, flour, and salt, I could surely whip these up in a cinch! Adding a scoop of vanilla ice cream will give it that little something extra. I cannot wait to try this recipe and see Santa and the elves’ faces as they dig into this delicious fall treat! 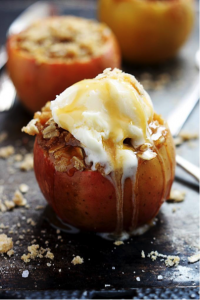 If you try this recipe too, I’d love to see how your Apple Crisp Stuffed Apples turned out. Instagram @MySanta or tweet us @MySanta your yummy desserts!